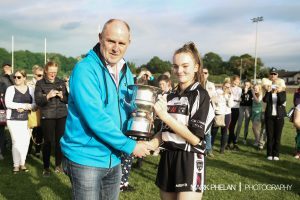 On a beautiful June’s summer evening in Hawkfield Kilcullen u 16 girls made history collecting their first ever Division 1 u 16 title to add to this magnificent team’s Division 1 u 13, u 14 league Titles and their u 14 Kildare Feile and All Ireland Feile Silver Medal. Space was difficult to find as Maynooth employed a sweeper. Kilcullen responded by moving their versatile corner back Siobhra Behan onto her. Kilcullen went 3 points up with excellent points from Sally Murphy, Sydney Sheridan and Ruth Birchill. Following a high ball into the square from a Maynooth free which Kilcullen failed to clear and the Maynooth forward found a tidy finish to the back of the net. Maynooth added a nice point to go ahead. Sophie Ngai pointed twice (one with the right, one with the left) to nudge Kilcullen in front. Maynooth’s strong running was matched by an almost flawless defensive effort from the Kilcullen. Emily Kelly and Jenna Pembroke were winning lots of ball in the full back line and pressuring Maynooth when shooting. Kilcullen’s half back line was outstanding and got on top after 10 minutes with u 14 Ellen Coleman at center half back putting on a master class. She was ably assisted by the strength of Hannah Crowley and the athleticism of the excellent Jill O’ Toole. Kilcullen’s outstanding young half forward line of Edwina Birchill, Eabha Devenney and Sophie Ngai who kicked from play 19 goals and 47 points in 6 division one matches dropped out closer to midfield to create space and were ably assisted by the excellent midfield due of Sally Murphy and Ruth Birchill who were putting in lung bursting efforts. Abbie Fitzgerald moved onto Maynooth’s sweeper and her strength and cleaver passing was helping to turn the game. Kilcullen started to dominate. Edwina Birchill never stopped running and passed to set up scores for her team time and again. Maynooth’s excellent net minder Aine Dooley pulled off a string of excellent scores. The breakthrough goal came when Aine pulled off an incredible save from a brilliant strike from Eabha Devenney and Kilcullen’s lively corner forward Molly O’ Loughlin was quickest to react, gathered and slotted home calmly. Kilcullen kicked 3 further points from Sally Murphy (2) and Sydney Sheridan to leave the half time score of 1-8 to 1-1. The key score came when Kilcullen’s Sydney Sheridan secured the ball from the second half throw in and brilliant passing and moving resulted in Sally Murphy giving the ball to Ruth Birchill who accelerated and gave a lovely hand pass to Eabha Devenney who had peeled off her defender and Eabha busted the back of the net with an unstoppable shot. Kilcullen went on to kick some beautiful long-range points from Sophie Ngai, Sally Murphy, Eabha Devenney and a cracking left footer from Ruth Birchill. 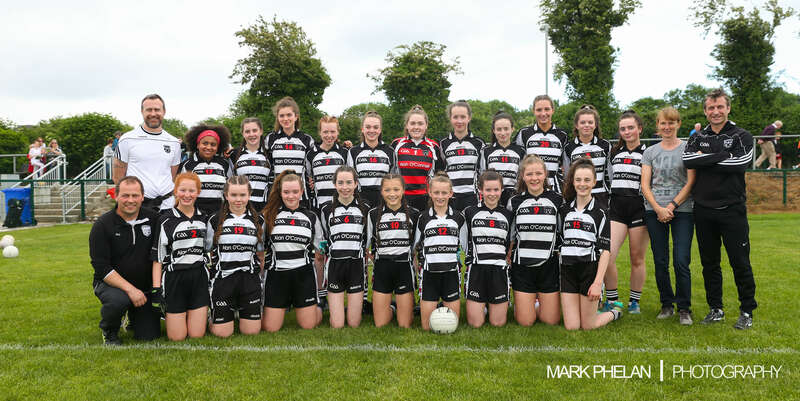 Maynooth kept pressing forward whilst Emily Kelly’s reading of the game at full back was outstanding and the Kilcullen defenders worked the ball out time and time again with brilliant passing. 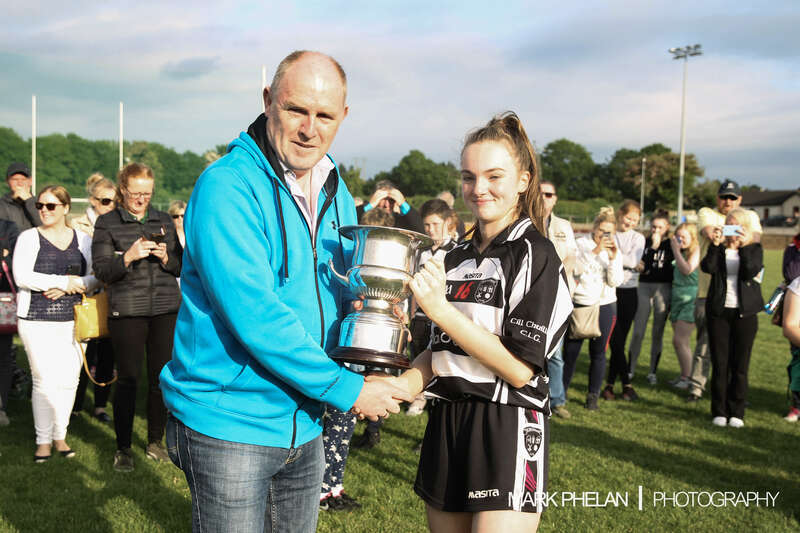 Maynooth had their chances whilst Kilcullen’s keeper Rachel Carey remained calm and pulled off some brilliant saves and her kicking distribution was top class. Siobhra Behan moved back to her defensive position and again demonstrated her brilliant defensive abilities. Tara Murphy (captain) and Eleanor Traynor were having a huge influence on the game and both pointed, and they were unlucky not to get goals as the ball narrowly went over the cross bar. Tara showed great leadership with a brilliant steal and point and Kilcullen were now out of sight. Rachel Keane, Chloe Acton and Mia Whelan were all introduced and done brilliantly to finish off the game for the Rags. Maynooth to their credit never game up and scored some late points to leave the final score of Kilcullen 2-17 to Maynooth 1-7. Kilcullen scorers: Sally Murphy 0-4, Eabha Devenney 1-2, Sophie Ngai 0-3, Sydney Sheridan 0-3, Molly O’ Loughlin 1-0, Ruth Birchill 0-2, Tara Murphy 0-2, Eleanor Traynor 0-1. Kilcullen Panel: Rachel Carey, Jenna Pembroke, Emily Kelly, Siobhra Behan, Chloe Acton, Rachel Keane, Jill O’ Toole, Ellen Coleman, Eleanor Traynor, Mia Whelan, Hannah Crowley, Ruth Birchill, Edwina Birchill, Sally Murphy, Molly O’ Loughlin, Eabha Devenney, Tara Murphy(captain), Sophie Ngai, Sydney Sheridan, Abbie Fitzgerald.